I write this humble missive on not just the eve of The Aristocrats East Coast/Canada/Chicago tour, but also on the eve’s eve of the Mike Keneally/Bryan Beller bands’ October West Coast tour, and on the eve’s eve’s eve of two tours with Kira Small later in the year. does that equal a fortnight? I’ve always wondered what that was. And, as always, here’s the compete BellerBytes with all of the attending detailature. Man, I just love making up words. Plus some big news: Kira Small and I are releasing a live duo album in November! That’s in the BellerBytes as well. So, like, read it. Gotta pack. See you soon. All the details are – you guessed it – on the calendar page. Tarheel Staters, we’d love to see you at one or more of these very special engagements. And of course, the Aristocrats CD presale continues unabated, and the Keneally/Beller west coast tour is still very much a hot topic ’round these parts. There’s your update. As you were, kind netizens, as you were. The Aristocrats Debut CD Available For Pre-Sale NOW! 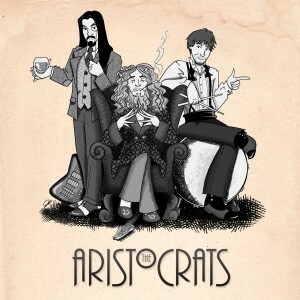 The Aristocrats debut CD is now available for pre-order at the brand new Aristocrats online store. Pre-orders will ship by September 13, and you will receive a link to your digital download at midnight EST on the 13th. That’s just two weeks away! Want to hear a sneak preview of the whole album? Check out this five-minute montage teaser. Guthrie, Marco and I have been working on this CD since March. We each wrote three songs for it, and we worked like crazy to get it all just right. That said, it was great fun for all of us really getting to know each other musically, a process that’s continuing to this day. It’s also been a pretty incredible journey, as Marco and I just met Guthrie this year, and suddenly we’re a band with a record about to come out that lots of people seem to care about. We’re really grateful for that. Thanks to everyone who supported us with comments of encouragement (and in many cases, much more than that) along the way. Hopefully you’ll have as much fun listening to it as we did making it. And maybe we’ll see you on tour in the eastern U.S., Canada or Chicago this coming month as well.